Experience a yearly social media event that celebrates the customer experience across a wide range of perspectives. It's called "Bathroom Blogfest" and takes place the last week in October. 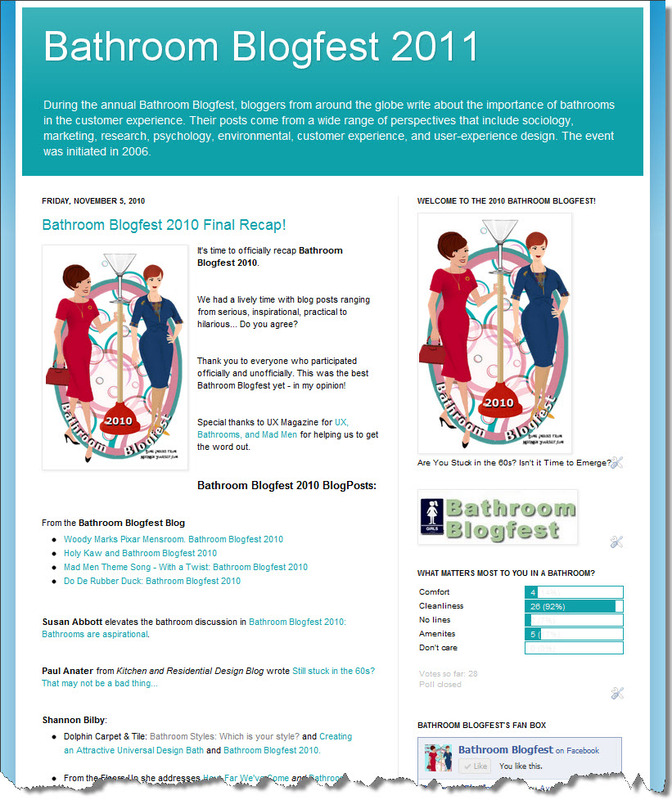 Bathroom Blogfest was launched in 2006 and has taken place every year since then until 2012. It began as the brainchild of Stephanie Weaver, Experienceology author and consultant, and Susan Abbott, business consultant and consumer researcher in Toronto. They wanted to generate awareness for bloggers passionate about the customer experience at a time when blogging was more experimental. By writing blogposts, tweeting, creating Facebook updates, bloggers participating in the Bathroom Blogfest call attention to an intensely compelling topic and one that has universal relevance and appeal regardless of the industry or blog area of focus. Each Bathroom Blogfest focuses on a new theme. The 2011 Bathroom Blogfest urges participants to "Climb Out!". [See Bathroom Blogfest 2011 Urges 33 Bloggers to 'Climb Out', Reinvent Customer Experience.] It included a fantastic Twitter Chat with #KBTribeChat, too! The 2012 Bathroom Blogfest has just been announced! The 2012 Bathroom Blogfest focuses on "Still Climbing Out!" The Bathroom Blogfest site captures in one place all of the contributions from the yearly Bathroom Blogfest. Go check it out! If you'd like to participate in the next Bathroom Blogfest at the end of October, please let Chief Simplifier Christine Whittemore know! She acts as Chief Inspiration Officer and Organizer of the Bathroom Blogfest and welcomes new participants. and our Bathroom Blogfest articles on Flooring The Consumer.